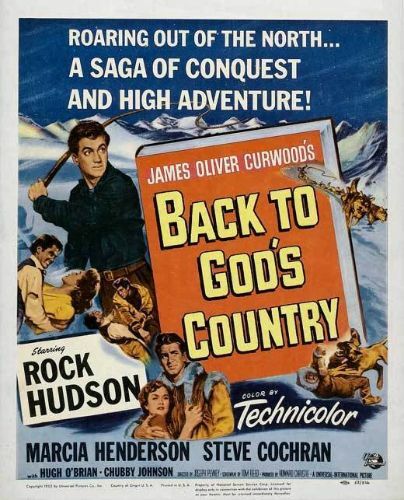 The oft-filmed James Oliver Curwood yarn Back to God's Country is given the Technicolor treatment in this 1953 cinemadaptation. Set in the Great White North, the story concerns a romantic triangle consisting of sea captain Peter Keith (Rock Hudson), his wife Dolores (Marcia Henderson), and his jealous rival Paul Blake (Steve Cochran). Things come to a head during a treacherous trek through the snow, to seek medical aid for the injured Keith. Despite the crooked chicanery of Blake and dishonest guide Frank Hudson (Hugh O'Brien), the day is saved by Keith's faithful Great Dane. Back to God's Country overcomes its old-fashioned plotting with spirited performances and excellent cinematography.